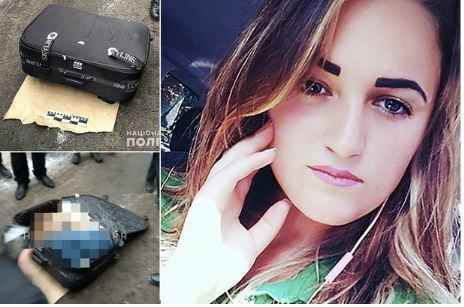 The body of a half-naked woman was found stuffed into a suitcase and dumped in rubbish bin as police in Ukraine launched a murder inquiry. Daria Bilous was just 19 and was found curled up in the suitcase wearing just a bra and jeans. Witnesses saw five unknown men disposing of the bag containing the student’s body before vanishing. Forensic tests show the student, who was attending a vocational college in Dnipro city, died from strangulation. She added that a “homeless man” examined the bag in the bin, and saw it contained a body. Locals then called police. A video show officers lowering the bin to get to the bag, before opening the suitcase to reveal her body. Witnesses said there were no obvious signs of violence to the body. Ms Bilous had celebrated the New Year in capital city Kiev and then returned to Dniprop in central Ukraine on Thursday, January 3. Nor was it clear who she had travelled with. Police are talking to people in her “social circle” and her online contacts, say reports. The victim is said to have been raised in care, after her parents were deemed incapable of looking after her. The post Semi-Naked Student Found Dead In A Suitcase And Dumped In A Waste Bin (Photos) appeared first on Naijaloaded | Nigeria's Most Visited Music & Entertainment Website.